Amazon: The go-to retailer for all things television, bulk cleaning items and sweatshirts that advertise eating disorders. 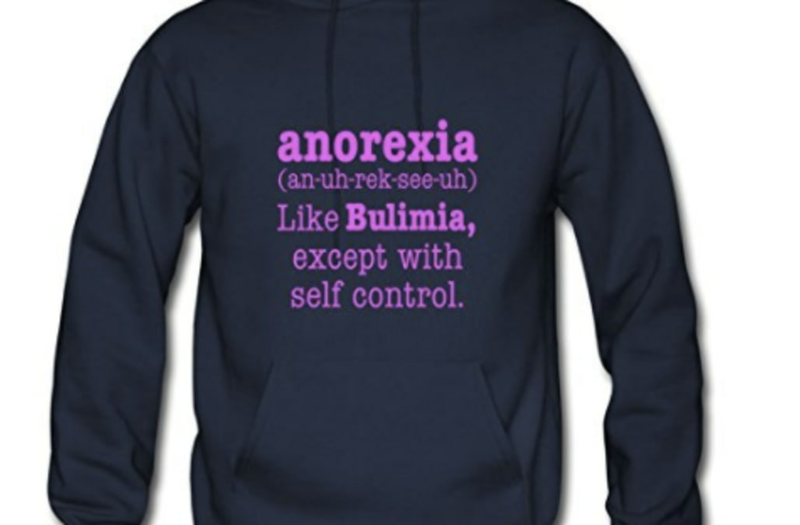 The online retailer is getting slammed for selling a sweatshirt that seemingly promotes both anorexia and bulimia. 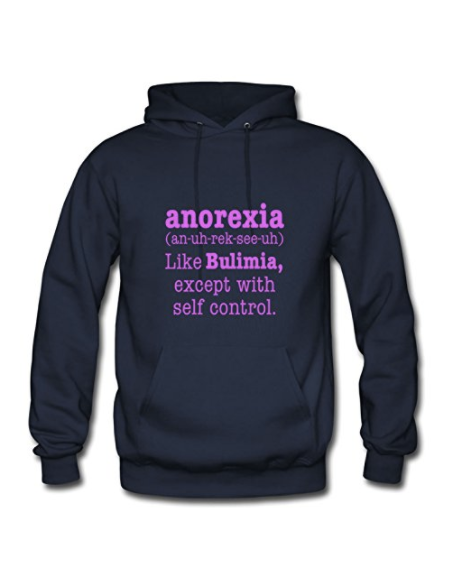 The hooded navy pullover, which has been on the site since 2015, boldly spells out "anorexia (an-ur-rek-see-uh) like Bulimia, except with self control" in pink and sells for $30. Sold by "ArturoBuch," the item -- for obvious reasons -- is faced with only 1 star out of more than 170 reviews. Many took to Twitter to criticize the retailer for the product. Some have called it "disgraceful and irresponsible" while others have deemed it completely "insensitive." "It's absolutely disgraceful and irresponsible"
A new BBC report on the hoodie found that many were concerned with the damage the product could do to those already suffering from an eating disorder. The product is "a way to make people feel really awful when they were already anguished enough," said Dr. Susie Orbach to BBC. She explained, "We're breeding a culture [where people think] you should transform your body, you should comment on it, and if it isn't the way you want it to be it's got to be some other way." Similarly, the National Eating Disorders Association issued a statement in response to the product to TODAY: "Jokes about eating disorders are dangerous and cliche," CEO Claire Mysko said. "This hoodie propagates the myth that eating disorders are trivial and mere issues of willpower or self-control. Stereotypes like this result in increased stigma and are barriers that prevent people from seeking help. Anorexia is not a 'lifestyle choice,' it is a mental health disorder with socio-biological influences. We ask that Amazon stand with those affected by these deadly illnesses and remove the sweatshirt from their store."